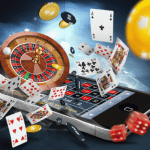 Irish Eyes is a mobile online slot game at Luck’s Casino powered by Chartwell gaming and promises players a fun-filled gaming experience. 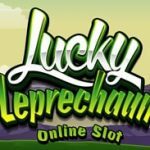 Irish slots online has 5 reels and 25 paylines and is full of iconic symbols that one would expect to see such as a Rainbow, Pot of Gold, and a (hopefully) lucky 4 Leaf Clover. The jackpot amount on the base game is a whopping 10,000 coins, meaning that even players who made the minimum wager of 0.02p on all 25 paylines could still win £5,000! 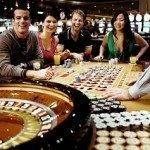 While playing Irish slots online at Luck’s Casino, you will be captivated by the in-depth representation of all the things Irish – the most notorious being the ability to have fun! 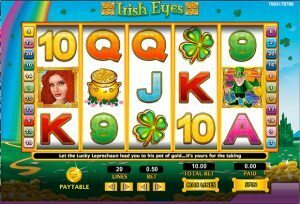 Irish Eyes online casino game can be played either for free or for real money. The coin denominations vary from 0.02p to £5 per payline bet which can be in USD, EUR or GBP. The maximum bet is £125 per spin meaning that players who hit the 10,000 coin jackpot by getting 5 Leprechauns on the reels, could cash out a jaw dropping £1,250,000! But if it’s Scatters you’re after, keep an eye out for the Irish Lass. The Irish Eyes scatter symbols is a spin, which generates at least three Irish Lady symbols. Here, you will enjoy 12 free spins and any coin rewards won from the payline will be tripled. With a theoretical Return to Player of over 96% as well as loads of different winning combinations, there’s no limit to how much Irish Eyes players can win. 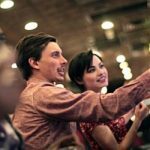 Reasonable wagering requirements and low real money bet amounts means that players can bet as little or as much as they like. 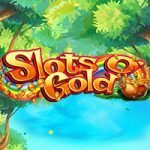 Irish Slots Online game is one of the most popular themed online slots in the UK – start playing now to find out why!